How does Sly Fox Shopper compare with other forms of advertising? Sly Fox Shopper gives you a way to advertise your promotions that’s cheaper than using Google, local newspapers, and other media, but also much more targeted. And because you only pay for promotions while they are live, Sly Fox Shopper is also highly cost effective. Do I need to open an account with Sly Fox Shopper? You will need to register your business with Sly Fox Shopper, but we’ve made it simple to do without the need for lengthy form filling or having to provide references or go through credit checks. Setting up your store with Sly Fox Shopper is completely FREE. What’s the main advantage of Sly Fox Shopper over other forms of advertising? It’s much more localised. That means you can get your promotions down to a really local level so they get noticed straightaway by shoppers on your doorstep, the people most likely to buy from you. Does Sly Fox Shopper work for the smaller retailer? Absolutely. Our exceptionally cost-effective charging structure means that even if you have the smallest of shops, you can still get listed alongside much larger retailers who would normally overpower you through their marketing. Are there any restrictions on the type or size of promotion I can offer through Sly Fox Shopper? As long as your promotion is legal, honest and ethical you can use Sly Fox Shopper to promote it. No. We charge only a straight fee that’s based on location (the size of your town or city), and how long you want to run your promotion for. With Sly Fox Shopper you won’t find us grabbing 50% or more of your sales, as some others try to do. In fact, depending on where you are, promoting your deals through Sly Fox Shopper could cost you less than £1 a day! Compare that with newspaper advertising or Google Adwords and you’ll see what a cost-effective opportunity this is. Is it is easy to register with Sly Fox Shopper and setup promotions? Yes. We have made joining Sly Fox Shopper as easy as possible for every kind of retailer. Once you’re registered you can download the user guide that will walk you through the process of setting up and maintaning your promotions step by step. How quickly will my promotions go live? Normally within an hour during normal business hours (Mon - Fri 09:00 - 17:00). This makes them the perfect vehicle not just for long-term marketing but also ‘flash sales’. If you setup a new promotion outside normal business hours and want it live straight away then you can always contact us and we will do our best to get it live ASAP. Can I use images in my promotions? Yes. It’s easy to include pictures in your promotions and if you don’t have suitable images yourself, we have stock images you can use. Can I run promotions just on particular days of the week? You can tailor your promotions on Sly Fox Shopper in the way that works best for you. So, if you want your promotions to be seen only at weekends, that’s easily done. Details about your store and the promotions you’re running will be shown to shoppers who are actively shopping in your town … when they are at their most ready to buy. 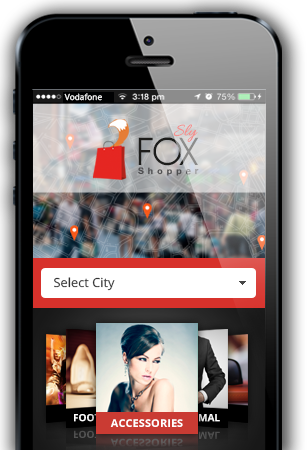 Sly Fox Shopper gives you a new way to interact with your customers as they shop nearby. How will shoppers find our store? As well as telling shoppers about your promotion, we’ll also provide details of your store, your website and even a map giving directions on how to find you. How will I know if the app is being used? At Sly Fox Shopper we track wehere and when the app is used and the information is visible on the site for registered businesses. Can shoppers make purchases direct from their phone using Sly Fox Shopper? No. Sly Fox Shopper is about alerting shoppers to your promotion so they physically come into your store and buy. Sly Fox Shopper helps you increase footfall into your store, so you can sell directly. What information can I include in my promotion? As well as details about your promotion, Sly Fox Shopper will also show information about your store, your website, address and even directions on how to get there. Do I have to pay for a promotion upfront? You make a single one-off payment to get your promotions listed on the app and website. As well as the great rates on offer, we’ll also give you an initial credit you can use to cut the cost of your promotion even further. The amount of credit you’ll receive will depend on your location.